A.H. Beck Foundation Co., Inc. is a specialty deep foundation, ground improvement and earth retention contractor that has been in business since 1932. The company’s heritage includes the ultimate pioneering effort of helping start the drilled shaft foundation industry in the United States. We are excited to announce the development and launch of the new website. 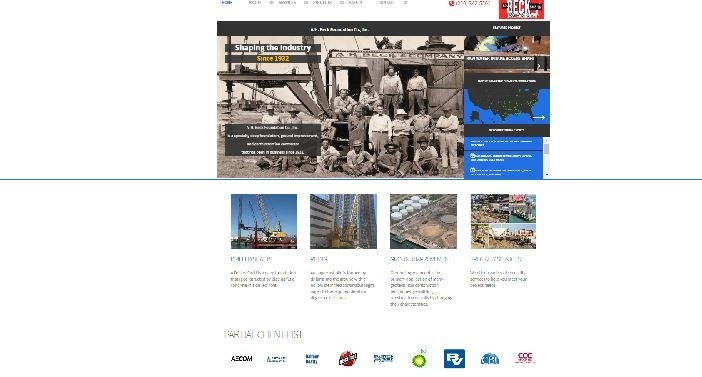 The new modern design of the website is intended to communicate not only the strong history of the construction firm that has been serving its clients since 1932, but also the tremendous energy, and breadth of its practice in construction methods as well as geographically. Presently, A. H. Beck has a diverse construction portfolio mix that practically spans the entire depth of ground improvement technologies, as well as retention and foundation systems. A. H. Beck has completed a large number of projects in the entire south and east of the USA, and has also been expanding to the west, as well as far north as Canada! The new Berkel & Company website was created to enhance the online professional image of the company and promote its services and expertise in a complete and clear way. In the decades that followed, A.H. Beck has continued to remain at the forefront of the deep foundation and ground improvement industry, and is regarded as one of the premier foundation contractors in the southern United States and elsewhere. Click to view the website live!